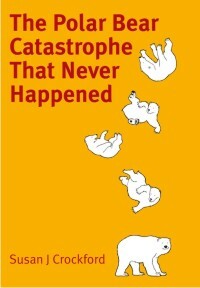 This is a short follow-up to my last post on Davis Strait polar bears. Today I’ll highlight a paper published last year (Rode et al. 2012) that had three of the same co-authors as the Peacock et al. (2012) paper I discussed on Monday – Lily Peacock, Mitch Taylor, and Ian Stirling contributed to both papers. Rode et al. (2012) deals with the issue of body condition (relative degree of fatness) in polar bears vs. changing levels of sea ice over time, and if you’ll pardon the pun, adds even more weight to the conclusion that declines in summer sea ice do not necessarily spell the disaster for polar bears we have been told is inevitable. 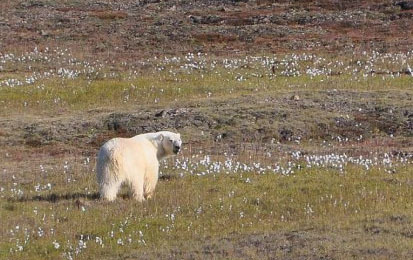 A polar bear in the summer of 2012 near Thule, NW Greenland (part of the Baffin Bay subpopulation). Note the decidedly chubby back end on this bear, who looks well prepared for winter. Photo by Robin Davies. 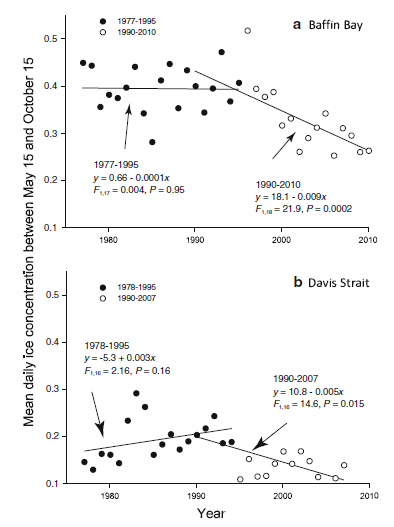 Karyn Rode and colleagues compared body condition of Davis Strait (DS) polar bears to those in Baffin Bay (BB, the subpopulation region just north of Davis Strait) between 1977 and 2010, in relation to summer sea ice conditions over that period. Summer sea ice was defined as the mean daily concentration between May 15 and October 15 each year. Both Davis Strait and Baffin Bay are considered to be ‘seasonal-ice’ habitats (‘ecoregions’) because virtually all of the sea ice melts each summer, as it does in Hudson Bay. In other words, because there was no decline of sea ice in Davis Strait prior to 1994, the decline in body condition could not be blamed on lack of ice (in fact, sea ice concentrations increased between 1978 and 1995, see Fig. 1 below). After 1994, while there was both a decline in body condition and a decline in sea ice, it could not be determined whether the high density of bears (due to the increased population size, as documented in Peacock et al. 2013 and described in my last post), or the declining sea ice, or both, was causing the decline in body condition. The data did not allow them to distinguish between those options – who would have thought? Figure 1. This is Fig. 2 from Rode et al. (2012), showing “mean daily summer sea ice concentration (May 15-October 15)” in Baffin Bay (top) and Davis Strait (bottom). The years of study are slightly different for the two areas. Notice that sea ice concentration for Davis Strait showed an increasing trend between 1978 and 1995 and a declining trend between 1990-2007. However, overall, the ice was not that much different in the later part of the study than it was earlier. More importantly, while the Rode et al. 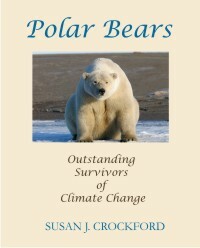 paper doesn’t come out and say it, the astonishing thing is that despite the declines in body condition they documented between 1978 and 2007, the number of polar bears in Davis Strait increased significantly – from about 1,400 to 2,158 bears (Peacock et al. 2013). In fact, the density of bears increased to such an extent (to about 5.1 bears/1000 km2) that there may have been too many bears for the habitat to support – all while the body condition of bears declined. I can only conclude that a decline in body condition may not be the harbinger of doom for polar bears that Arctic researchers have insisted (e.g. Stirling and Derocher 2012 and previous posts here and here). 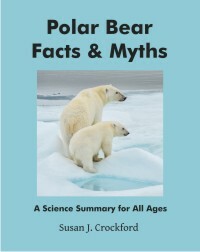 This entry was posted in Population, Sea ice habitat and tagged arctic sea ice, baffin bay, body condition, Davis Strait, Hudson Bay, Peacock, polar bear numbers, polar bear population density, relative fatness, robin davies, Rode, sea ice concentration, sea ice conditions, Stirling, summer sea ice, Taylor. Bookmark the permalink.